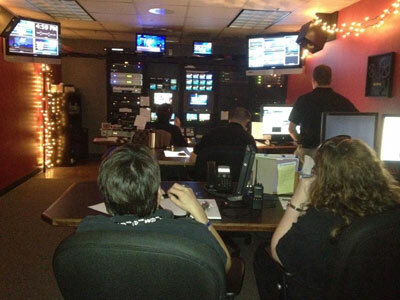 Encore Broadcast Solutions understands that the project does not end at installation. Today’s technology can be very complex and not every user may grasp the capabilities and features of their AV system without guidance. An Encore representative is available to be by your side as sometimes the manual doesn’t provide the same benefit as face-to-face training. Our goal is to make our customers feel confident so that they receive the highest return on their investment. We offer on-site training from our experienced technicians and certified trainers. This is available for a nominal fee as part of the commissioning process of our installation. Encore can provide training on anything from running an entire broadcast studio, emergency operation center, city council chamber meeting or corporate video conference. As we go over the installed AV system components and how your needs apply you will be able to ask questions. Some training can also be done via web or certain equipment might require factory training with the manufacturer. You may also contract training on an existing system at anytime to train new employees or to refresh current practices. At Encore we have the ability to gauge our customer’s skill level from support staff to end user and cater training accordingly to generate amazing results! You will be confident with your turn-key, user-friendly system ready to wow your audience. Your team at Encore Broadcast Solutions recognizes the importance of exceptional customer service and we make it our utmost priority. We have worked with many clients for over 20 years and their satisfaction is evident as we continue to generate much of our business from customer referrals. We always make ourselves available to you for support for questions or service needs. We have toll-free numbers available as well as an option via our website to be directly linked to a tech support representative or the ability to contact your area office via email. Equipment purchased through Encore comes with a standard one year warranty from us, along with any applicable extended manufacturer warranties. We also guarantee our installation labor for a period of one year. You will quickly realize when partnering with Encore that your Sales Representative is not just an order taker. They have the knowledge and experience to guide you through the entire length of your project and the relationship will last for years to come. Along with the sales staff we have on-site technicians and amazing administrative support staff for any questions from technical to billing. There are times when a vital piece of your AV system isn’t functioning properly or even worse stops working all together! At Encore Broadcast Solutions we can service your equipment or handle the repair via manufacturer. We consider your repair a priority therefore ensuring that you have the quickest response possible and if applicable a loaner or rental to ensure there is little to no downtime on your AV system. Encore offers customized preventative maintenance contracts that include guaranteed response time for phone support, priority response on service calls, scheduled visits and overall system testing at your request. This includes anything from troubleshooting, replacement of filters and lamps to maintaining equipment at original specifications. It is vital that your system remains fully functioning throughout your day to day events and Encore can take that responsibility out of your hands! We understand that protecting your investment is vital and we can help generate longer equipment life and optimal operation with proper maintenance. Whether you purchased your system through Encore or from another company we can support you. If it has been years since your equipment was purchased and installed it might be time to call us! We can include a program along with your new installation to ensure it is maintained properly. Encore is your single source solution that can design and install your AV system while being your trainer, service and support resource as well!